The headband lace: a vintage accent suitable to emphasize the most romantic choices or for those who want to add sweetness to a very simple dress. 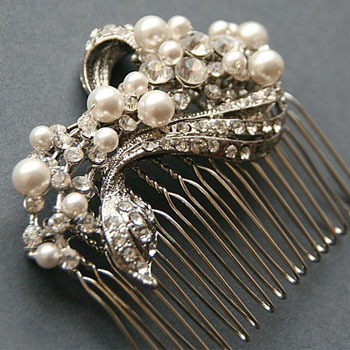 The comb in rhinestones: for those who love sparkle, or is planning to continue the ceremony with a dance party. The double thin band: a naive touch to dilute a very elaborate hairdo or for very young brides, to keep carelessly, simply collected hair. 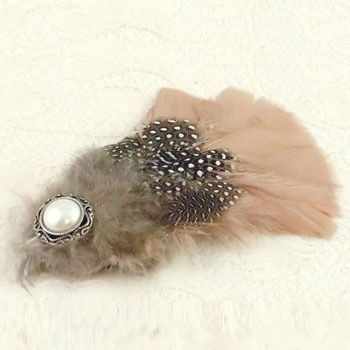 The clip with feathers: for those who want to impress. Add some more vain with peacock feather’s one! Il cerchietto in pizzo: un'accento vintage adatto a sottolineare le scelte più romantiche o per chi volesse aggiungere dolcezza ad un abito molto semplice. Il pettine in strass: per chi ama scintillare o ha previsto di proseguire la cerimonia con una serata danzante. La doppia fascia sottile: un tocco ingenuo a stemperare un'acconciatura molto elaborata o per spose molto giovani, a trattenere con noncuranza, capelli appena raccolti. La clip con le piume: dedicata a chi vuole stupire. Per le più vanitose… sceglietene uno in piume di pavone! When I initially left a comment I seem to have clicked the -Notify me when new comments are added- checkbox and from now on every time a comment is added I get four emails with the same comment. Perhaps there is an easy method you can remove me from that service? Appreciate it!